Sweet and tender chunks of shrimp on a bed of crunchy fried wontons, these Shrimp Wonton Chips make the perfect appetizer or snack. Hi everyone! 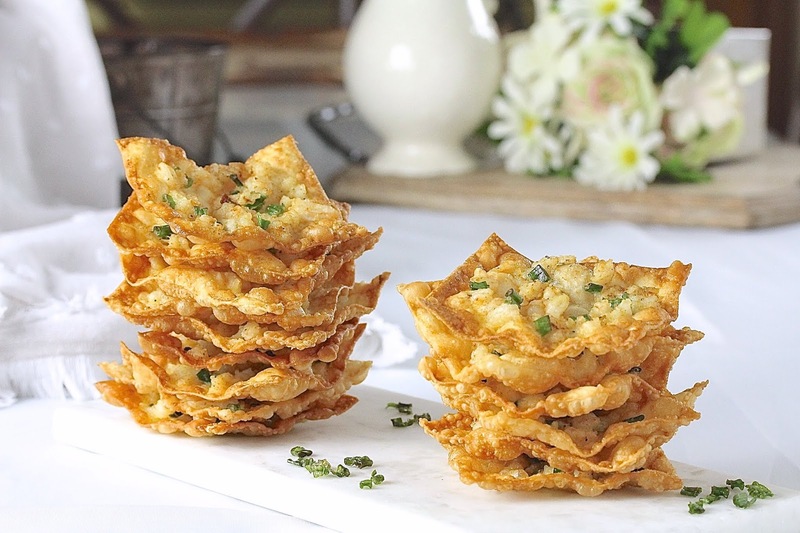 If you are looking for something easy to put together and a crowd pleaser, these Shrimp Wonton Chips are just the thing you've been looking for. They are AMAZING and addictive! They are extra light and crunchy around the edges with mild and tender shrimp throughout. And the scallion provides a pop of color as well as a little bite. When I say these are easy to make, I mean reallllly easy. There are six simple ingredients in the shrimp filling: shrimp (duh), scallion, ground ginger, egg, salt and pepper. And what I LOOOVE about these shrimp chips...there is no stuffing and no sealing of the wonton edges...none of that mumbo jumbo. All you've got to do is brush the wonton with the beaten egg and spread on the shrimp filling. Thats' it! Seriously, how easy is that?! The hardest and time-consuming part is the frying and that's even a piece of cake since these babies take less than 2 minutes to cook up. They are placed in the hot oil, shrimp side up and fried until the bottom turns golden. Then they are flipped, shrimp side down, to finish frying. This part literally takes 15 seconds! Of course, with any fried food, they are best eaten immediately. But these babies are delightful heated up. If you would like to make them ahead of time to serve to your guests or take to an event, fry them a few seconds less then instructed and store refrigerated or frozen (freezing retains better crispiness). When it's time to serve, reheat in the oven for a couple minutes. The last and best step, eat and enjoy!! These chips are fantastic on their own, so no need for a dipping sauce. But if you feel compelled to experiment with different ones, by all means, try them out. Come to think of it, ginger sauce sounds awesome! If you make this or have sauce ideas, I would love to hear about it! Preheat a large skillet with 1-inch deep oil on medium heat. In a medium bowl, combine shrimp, scallion, salt, pepper, ginger, and one egg. Beat the second egg in a small bowl. Brush and even layer of the beaten egg over the surface of 12 wontons. Spread about 1 teaspoon of the shrimp filling on each wonton. Carefully place a few wontons, shrimp side up, into the hot oil (3 or 4 wontons. Do not crowd). Cook until the bottom is golden, about 1 to 1 1/2 minutes. If your wontons cook too fast or take to long to fry up, adjust heat accordingly. Flip wontons over and fry for about 15 seconds to finish cooking the shrimp. Remove wonton chips to a drying rack or paper towel lined sheet pan. Repeat frying the remaining wontons. Continue assembling and frying wontons in batches of 12. Serve. Keep the chunks of shrimp small. They stick to the wontons better during frying. Since the wonton chips are large and cook up quickly, it is easier to fry them in small batches. There will be a bit of splashing once the wonton is flipped, shrimp side down, during frying. To minimize splashing, be sure the shrimp is completely dried off with paper towels prior to making the filling. Use a fine mesh splash guard to contain splashing, if available. I would LOVE these! 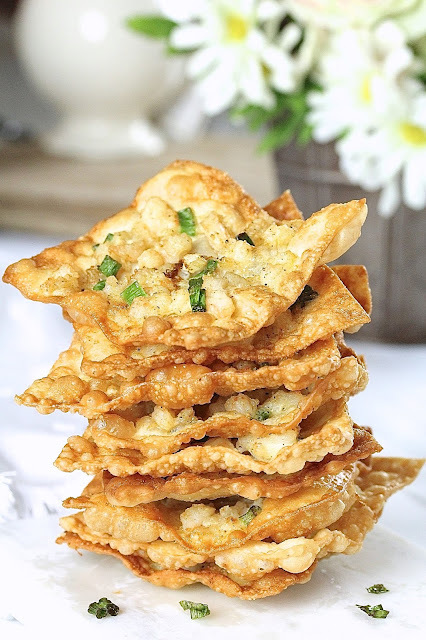 I would have fried wontons with cherry sauce as a little treat growing up and they were always delicious! I know I could eat the entire batch of these, lol. Love how easy they are to prepare...too easy ;) Have a wonderful week, Thao! Yum! Fried wontons with cherry sauce sounds so good! I'd eat it all too! I hope you have a great too, Dawn! oooh yum! i'd be scared of the shrimp filling floating off and away lol. these sound so delicious, and completely different than the shrimp chip i'm thinking of (the storebought super crunchy ones!). I bought a deep fryer a few years ago and have never used it. I don't know why I don't deep fry. But, now this recipe - I'm getting it out and dusting it off! thanks! I'm so glad I inspired you to take out the fryer! I'd love to know how it goes. Thanks for stopping by, Mimi! Thao, these look incredibly addictive. I would not be able to stop at just a few!! I am just imagining their taste, and I know I would LOVE them! This looks so crunchy and totally addictive! Love that they are so easy to make too. If I had to choose a dip... maybe a creamy chili lime sauce? What a great suggestion for a dipping sauce, Marie! I'll have to try it! Thanks for the suggestion. Ooooh! 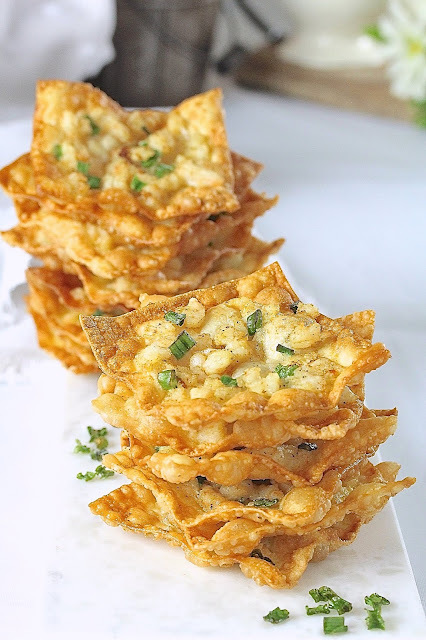 Your wonton chips look like an excellent reason to pull out my deep frying pot. I want to reach right in and grab a few. :) And thanks for the make-ahead tips because I would totally want to fry them up early for a party. It is a great reason to pull out the deep fryer, Annemarie! I don' t mind frying these because they don't take long to cook. These chips freeze beautifully! Yesterday, I reheated a few that I froze a few days earlier, and they came out nice and crispy! These sound unbelievable Thao! Can't get over how easy they are to make and so perfect to serve these with drinks for company. Although I might not want to share cos I could eat the whole batch by myself. I don't know, Kelsie, but I do enjoy being addicted to them!! I'm so glad you're making them or the game. I hope your guys win!! Thank you! 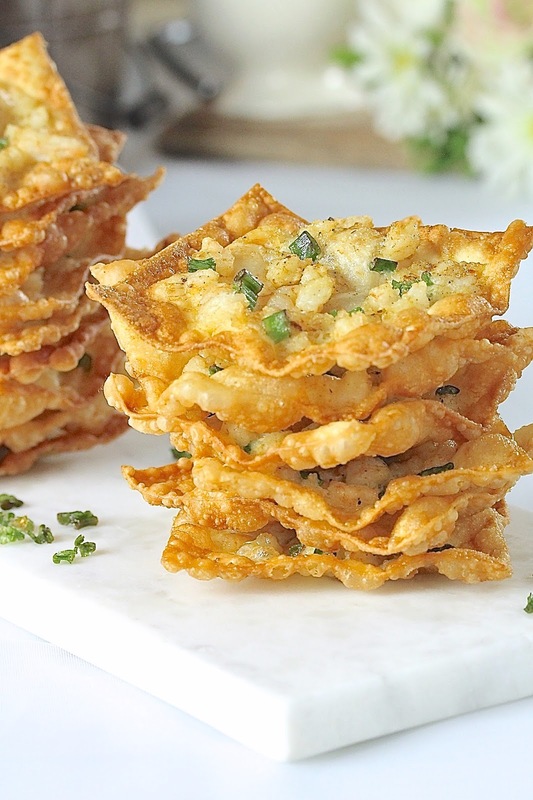 I love the crispy wontons. It's so addicting that you can't stop coming back for more! OMG I love shrimp chips! This version sounds amazing, how fun and easy!